For a long time I've been using this blog exclusively as an online portfolio for new works. As I have discovered after several years, it is a highly inefficient portfolio that is difficult to navigate back through. I recently started an Instagram feed for my art, and instantly it has provided a better organized platform for images as well as a much higher level of engagement with an art-interested social network. There are shortcomings in searchability, but the benefits outweigh them. So I'm left with the question of what I'm going to do with this blog. I've left it here because it has lots of older images, but that will be less valuable as I backfill the Instagram feed with older work. Deep thoughts and spontaneous communications will probably go to the Facebook page. I'll post news here for people who are looking for information from my home site, but that's not going to drive many updates. We'll see. 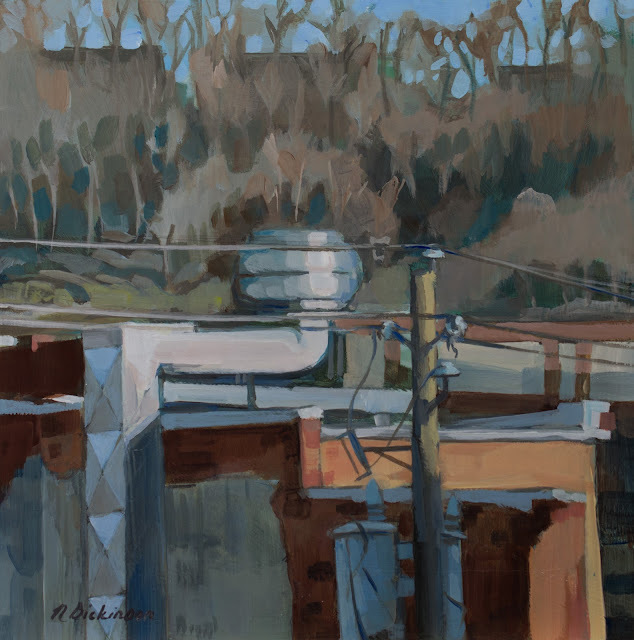 In the meantime, here is a recent small painting looking from Church Street in Asheville towards the back of Doc Chey's restaurant on Biltmore Avenue.